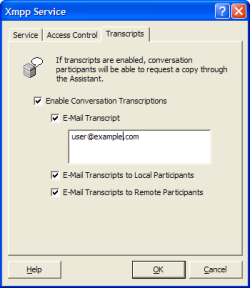 The Mailtraq Assistant is available as part of your Mailtraq license. Mailtraq Assistant is part of your download. You can install it at the time of the original installation or at a later date by selecting Custom from the install options. You can access the installer at a later date from the Windows Control Panel, Add & Remove Programs (or the equivalent). When installing on client machines, run the Installer, and select Custom. Then select only the Mailtraq Assistant option. 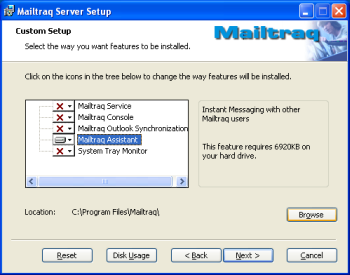 After Mailtraq has been installed on the server, the Assistant program, ma.exe, should be seen in the Program Files\Mailtraq directory where Mailtraq is installed. MA also needs to be installed on each individual client machine. In order to use the Mailtraq Assistant, Mailtraq itself needs to be running the XMPP service which installs by default in recent builds. XMPP uses Port 5222 which you may need to open in your firewall. When Mailtraq Assistant is run on the local machine, the 'speech bubble' icon will appear in the system tray. Double-click the icon to start (or right-click to access a menu). To login enter the local IP address or LAN machine name of the server running Mailtraq. The User Name and Password are the same used for the regular email collection via POP3, IMAP or WebMail. The icon also indicates your 'logged in' status: white = logged in, grey = not logged in.